Bluhm Burton Engineering attracts Black Economic Empowerment partner, Agile Capital. Established in 1990, Bluhm Burton Engineering (BBE), is internationally recognised as a world leader in mine ventilation and cooling systems. Being a ‘proudly’ South African company, and acknowledging the needs of the country, BBE has long had an in-house employee development programme. This has included full-time bursaries, professional development and a share participation scheme. However to meet the time-frame of the Broad Based Black Economic Empowerment Act it was decided to search for an empowerment partner. After being introduced to Agile Capital, the parties soon recognised the merits of the partnership. “The benefits for our company in securing the right BEE partner cannot be underestimated” says Dr Steven Bluhm, CEO: BBE Group. The Group continues to drive skills transfer and education through the development of young engineers. The firm regularly conducts training courses for the mines, mining companies and the various associations and societies affiliated with the mining industry. The BBE Group is registered with ECSA for the ongoing development of in-house professionals. South Africa’s engineering abilities remain world class, delivering complex mining and infrastructure projects. The BBE Group’s new equity partners will enable greater transformation and inclusivity in both the EPCM sector and consulting engineering sector. “We look forward to this new chapter in the BBE Group and driving the changes in our industry,” concludes Bluhm. At the AGM to be held on the 17th of August 2017 Sehliselo Ndlovu will be inducted as the SAIMM President 2017/2018. Herewith an introduction to the second female SAIMM president since the founding of the institute as well as the synopsis of her presidential address. Sehliselo (Selo) Ndlovu was born in Plumtree, Zimbabwe in 1975. Selo holds a BSc Honours degree in Metallurgical Engineering from the University of Zimbabwe; a Diploma of Imperial College in Hydrometallurgy, London, UK, and a PhD in Minerals Engineering from Imperial College. 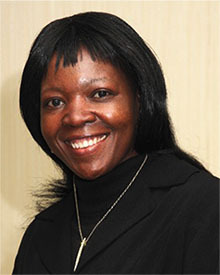 She is a Fellow of the Southern African Institute of Mining and Metallurgy (SAIMM), a rated researcher with the South African National Research Foundation (NRF), and currently holds the Department of Science and Technology (DST) and the National Research Foundation (NRF) funded SARChI Research Chair in Hydrometallurgy and Sustainable Development at the University of the Witwatersrand, Johannesburg. P.O. Box 61127, MARSHALLTOWN, 2017 Tel: (+27)11 834 1273. 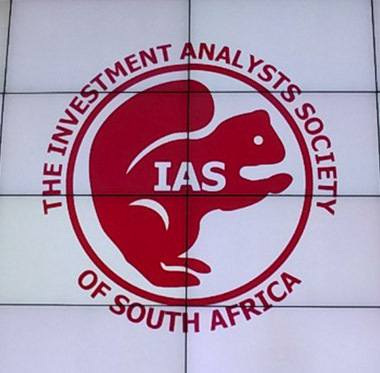 So, if you want to want to win a Squirrel next year, you don’t have to do anything except compile an exceptional JSE Section 12 and SAMCODE compliant Integrated Annual Report. Our adjudication panel will do the rest. Further information can be obtained at www.samcodes.co.za. GMSG has successfully published the first two parts of its Underground Mine Communications Infrastructure Guideline: Positioning and Needs Analysis, and Scenarios and Applications. The guideline is being developed by the Underground Mining Working Group’s Communications Infrastructure sub-committee. It will provide a high-level view of the processes needed by mine owners and operators to meet planning and design requirements when creating or replacing underground mine communications infrastructure. The Global Mining Standards and Guidelines Group (GMSG) and the Canadian Mining Innovation Council (CMIC) are pleased to announce the publication of the Recommended Practices for Battery Electric Vehicles in Underground Mining Guideline. This document is meant to serve as a blueprint for original equipment manufacturers (OEMs) to move forward in research and development, and references existing standards and guidelines related to battery electric vehicles (BEVs). Before this publication, there were no documents specifically related to BEVs in an underground mining environment. The Underground Communications Infrastructure Guideline Parts 1 & 2 and the Recommended Practices for Battery Electric Vehicles in Underground Mining Guideline are available for download in the GMSG library. 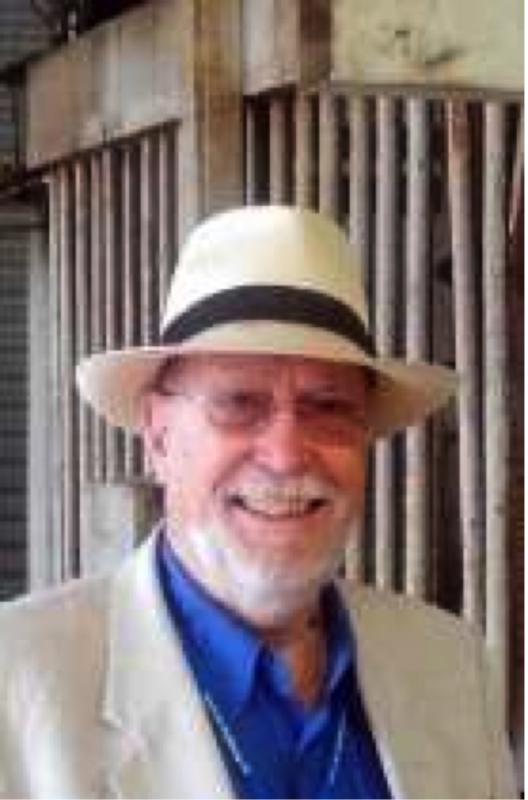 Professor C. Tim Shaw joined the SAIMM as a Student Member on the 14th October 1960. 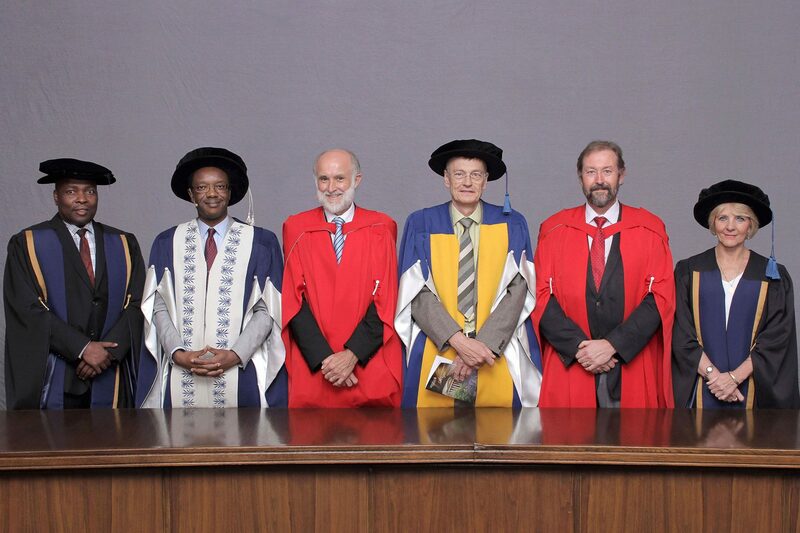 During his over 56 years of membership with the SAIMM Professor Shaw transferred from Student to Associate in 1966, Associate to Member in 1970 and has been a valued Fellow of the Institute since 1976. Professor Tim Shaw, who died on Friday 21st April at the age of 82, was Emeritus Professor of Mining Engineering at Imperial College London, having retired in 2001 after being appointed to the Chair in Mining Engineering at the Royal School of Mines in 1980. Prior to that he held an academic appointment at the Virginia Polytechnic Institute. He entered the academic environment after a successful career in the South African mining industry where he reached the level of Chief Consulting Engineer with the Johannesburg Consolidated Investment Company. 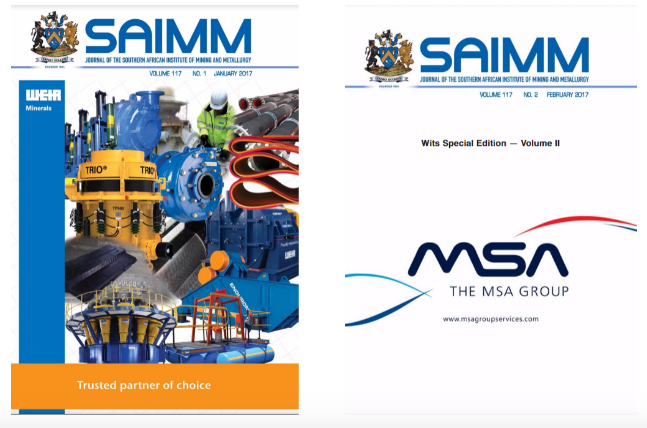 Exxaro’s CEO Mxolisi Mgojo and Exxaro’s Executive Head of Stakeholder Affairs and SAIMM Junior Vice President Mzila Mthenjane share “Exxaro’s Top Priorities” with the readers of the Inside Mining March 2017 edition. 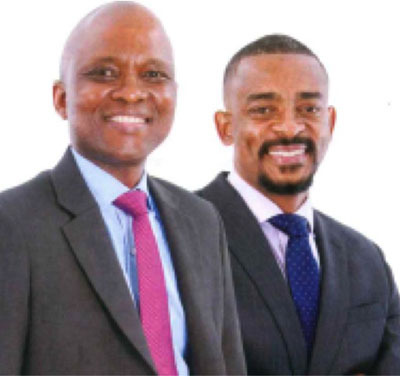 Building a prosperous black-owned company in South Africa takes visionary leadership and courage, according to the management team of Exxaro. For them, the environment and community development are of the utmost importance. Visit http://www.miningne.ws/2017/04/10/environment-and-communities-are-top-priorities-exxaro/ to read the full story Inside Mining March 2017 cover story. On the 31st of March 2017 Prof Rodney Jones, Immediate past President and Honorary Life Fellow of the SAIMM, delivered a very inspiring address to the graduates of Wits University. Prof Jones ended his address with the powerful and motivating words of advice for the graduates “You are graduating at a time of great difficulty in the world and in our country – a time of economic hardship and high unemployment. The challenge to your generation is to work to the best of your abilities to enable a world where we all work towards the welfare, safety, and health of all people, and care for our environment. Your success is determined not by the wealth you accumulate, or the position you achieve, but by how well you live your life. My message to you today can be summed up as learn continuously, and care about others in our world". Elected as a SAIMM Member in 2005, SAIMM Council Member in 2011, SAIMM Fellow in 2013, SAIMM Office Bearer in 2013, Honorary Treasurer in 2014 and serving as SAIMM President for the year 2016/2017 Prof Musingwini has been actively contributing to the SAIMM for over 10 years. On the 28th of February 2017 Joalet Steenkamp, SAIMM Fellow, received the Extraction and Processing Division’s (EPD) Pyrometallurgy Best Paper Award on behalf of the authors of “Tap-Hole Life Cycle Design Criteria: A Case Study Based on Silicomanganese Production". The Award winning paper by J. D. Steenkamp, J. J. Sutherland, D. A. Hayman and J. Muller was published in JOM June 2016, Volume 68, Issue 6, pp 1547–1555. In the picture Dr Steenkamp is receiving the award from EPD Vice-President, Cindy Belt, in San Diego, California, USA. 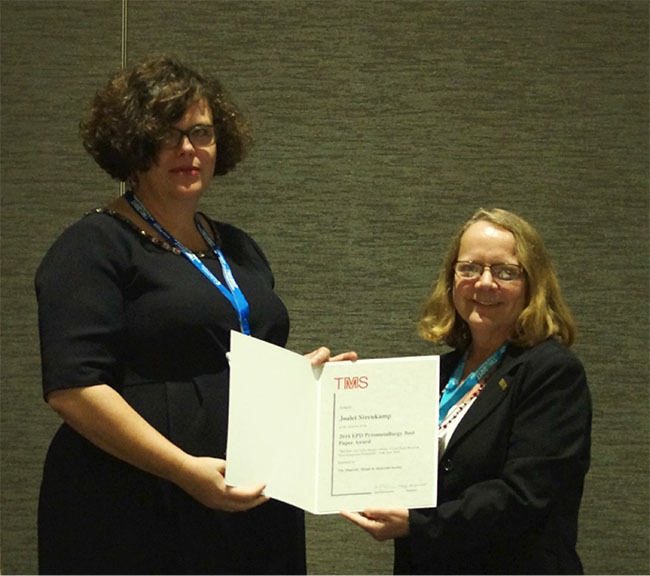 L. R. Nelson was the first Extraction and Processing Division’s (EPD) Pyrometallurgy Best Paper award winner in 2015 followed by N. Tzouganatos, M. Dell’amico, C. Wieckert, J. Hinkley and A. Steinfeld in 2016. Visit www.tms.org for more information regarding The Minerals, Metals & Materials Society and the TMS journal JOM.